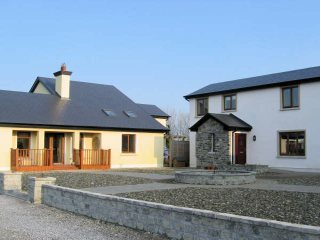 Galway East Tourism - O\'Neill\'s Self Catering in East Galway, West of Ireland.Galway East Tourism - O\'Neill\'s Self Catering in East Galway, West of Ireland. A warm family welcome awaits you at O?Neill?s Caher Cr?, self-catering accommodation. Our tastefully finished semi-detached holiday houses combine a traditional aesthetic with modern comforts and amenities. The purpose-built accommodation, which includes a paved courtyard, inhabits a six-acre site which also includes our family home, so we can ensure a warm and hospitable welcome for all our guests. Horse lovers will be able to meet some of the Connemara ponies and foals that we breed on site, and one of the key features of the location is that visitors will genuinely feel that nature is a short walk away. Caher Cr? houses are situated adjacent to a peaceful wooded area and a restored historical structure and grounds. During the summer months this secluded spot serves as a venue for picnics and classical musical recitals. The surrounding landscape provides stunning views of the Burren Hills (to the West) and Slieve Aughty Mountains (to the East). Ardrahan is conveniently located on the N18 between Galway City and Airport (20 minutes drive) and Shannon Airport (30 minutes drive). The coastal town of Kinvara is only a 10 minute drive away, and is famous for its traditional music all year round and its excellent choice of restaurants and pubs. The town plays host to the annual Cuckoo Fleadh music festival, and the Crinniu na mB?d, during which you will see the famous Galway sailboats 'Hookers' gather in the bay in one of the biggest festivals in the West of Ireland. Our location provides an ideal base for day trips to Coole Park Nature Reserve, the Burren, Aillwee Caves, Bunratty Folk Park, Thoor Ballylee, the Cliffs of Moher, Connemara, Galway City, and Ennis. Each holiday home sleeps six and has three bedrooms. Downstairs consists of a kitchen/dining/living room with gas fire and all modern conveniences, a double bedroom, and w/c with shower. Upstairs consists of a king-size bedroom (with TV), a twin bedroom and a full-sized bathroom. Gas and electricity included in price. Family friendly (babysitting services are available on request). Satellite TV, DVD and Video. Deposit 50 % on booking, balance due one month before arrival. We would be more than happy to answer any queries and look forward to welcoming you.